Hip hop is supremely entertaining. An ordinary looking guy (and street dance is still predominantly a male preserve), will amaze you by spinning on his head or throwing a somersault with no visible preparation. But it’s a challenge to extend the form into a full evening entertainment and achieve legitimacy as theatre art. 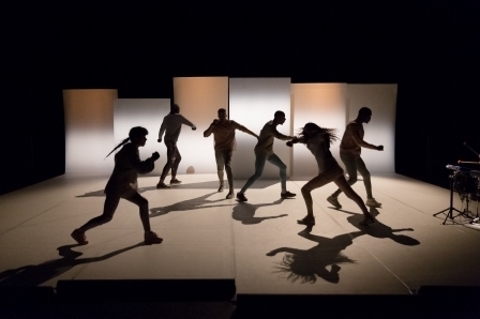 However, Pierre Rigal’s Scandale is an entertaining package of well-structured dance theatre. Scandale poses that well-worn question, is music or movement the mother of dance, but it remains unanswered as sounds and dance find harmonious union in all manner of setting, taking turns to lead and follow as happens in all good partnerships. Without resorting to pick ‘n’ mix, Rigal assiduously uses the versatility of his team and a range of theatrical devices to hold his audience’s attention. The design element of six screens both mask and background, creating neat entry and exit points. They are used imaginatively in an opening ploy as legs sprout like new shoots at various levels from behind the screens. Later in the show bathed in an ochre glow, Rigal uses some sort of concealed support to bring the movement to a new dimension as legs glide, snake-like, across the stage propelling weightless bodies. Musician, Gwenaël Drapeau, is the shamanic leader. He’s a weird figure wearing a dark cloak covered with spangles, his head wrapped in a grey hood. His drumsticks become wands as he guides the dancers to assemble his drum kit on side stage where he continues to provoke with curious noises. Voiced sounds, from rhythmic breathing to shrieks of laughter bring the group into a huddle round a microphone. They become a twitching machine of many moving parts, individuals moving to the same beat while each dancer has a unique trajectory. There is also plenty of space for individual show-off moments when, in street-battle style, the stage comes alive as energy charged dancers take centre stage to display their special skills. The company of six dancers and one musician (allowing for some interchange) are as diverse as one could wish. They show an amazing range of heights and shapes, but each is a master of their art. The two women, who are small enough to be tossed and thrown around, seem as much at home on hands, heads or feet but all have bodies that hyperflex and fold and legs that are driven by supernatural powers. A low-key fade to finish was just one more unexpected factor in this highly original production that offers the thrills of hip hop and more.